The use of technology to foster creativity, problem solving, communication, and critical thinking has been a cornerstone of the Saint Ursula academic program for over a decade. At Saint Ursula, each student uses a tablet PC, equipped with a touch screen and writing stylus, as a primary tool in her classes. With access to class materials, textbooks and other resources online, a student’s tablet PC is a gateway to her understanding content, communicating ideas and exploring new knowledge. In addition to the tablet PC, students utilize graphing calculators, a video production lab, music technology lab, and 3-D printers. The use of these tools is incorporated in core and elective classes. 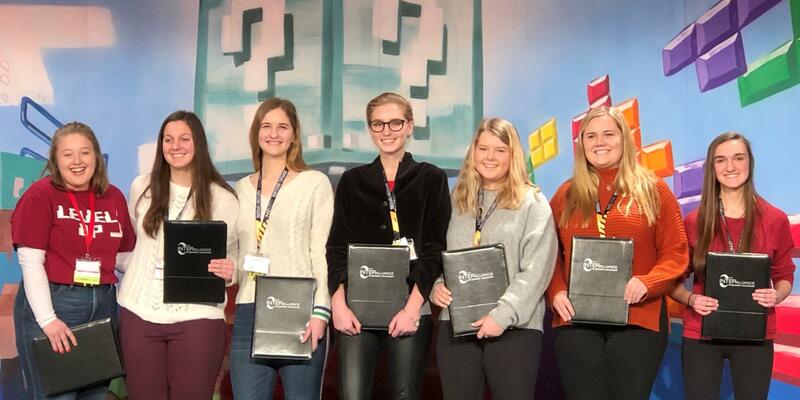 Saint Ursula Academy students from the SUAT/INTERalliance club won the 2019 INTERalliance TechOlympics Showcase competition. The SUA team beat 17 other area high schools in the competition!